Have a wardrobe full of only pieces that bring a smile every time I open a drawer or door. How awesome would that be to love every piece? To wake in the morning or open a drawer and feel warm and fuzzy over every item you lay eyes upon? Heaven. Pure heaven. Use up my stash instead of hording. My fear of cutting into fabric because I'll never get more of it needs to fade. To paraphrase what my practical Grandma would say, "Don't save it for his next wife; wear it. Life is too short & sweet to not use the good china or wear your pearls & fur coat." She lived up to that too. She & her friend used to wear their fur coats to the movies and eat chocolate covered cherries and let it all run down their chins. Now that's livin! Minimize my purchases to only items needed (notions, lining, etc.) to complete a projects. As items wear out or a gap discovered, quickly and easily make any item I need or want. Fill-In-The-Gap sewing also challenges me to be creative and learn to make something new. For example, I've sewn with denim, but I've never made Jeans before. And, when I knew my regular bras were starting to wear out, I bought kits and DVD's from Bravo Bella. Currently I'm on the adventure of "fill-in-the-gap" sewing for my athletic wardrobe. I've currently identified swimsuits, yoga stuff, sports bras and hiking gear. I'm allowing myself to not race out and buy something I need (I'm saving money to travel the world), but rather offering time to discover what gaps I have in my athletic wardrobe as I wear pieces and am out being active. I feel better about myself and my choices to wait before purchasing when I allow the gap in wardrobe or gear to make itself known to me rather than me try to plan and figure out every little thing I might ever need. It's a more of a relief than I ever would have imagined to let go and trust that I'll be ok with what I have even if I do have a gap. I feel more centered and less stressed. Woo hoo! A wardrobe full of clothing I actually love to wear and do so regularly. Unless it's a costume, and sometimes even then, I feel sad when a piece is only worn once a year if that. That dress you wore to a wedding once? Why keep it if you don't love it and wear it? Clothes that don't quite flatter? Ditch 'em. Or don't even make them. Someone else will look amazing in them. Feel funny, silly, frumpy, uncool, old, young, or whatever in a piece? It's time for it to go if you don't feel like your best and brightest self in something. It's amazing how much my entire mood lifts when I wear something that I love and feel good in. Of course there will be days on occasion when you'll look amazing but still feel "meh." That's part of being human. When I wear a piece I love, especially one I made, and someone else expresses their love & appreciation for it I am overjoyed. That makes my whole day! 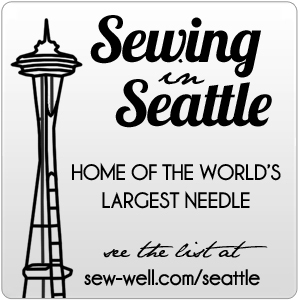 Sewing for me is about perpetuating joy and making things I love and love to wear. When I left the corporate world, I also donated my suits, black socks, and slacks. It was very freeing and it also helped me release many of my sad/depressed emotions that went along with those jobs. There were good days, but it was also a dark time in my life. Goodbye dark, navy-blue/grey/olive/black biz casual and hello bright & colorful Jeans & T-shirts. The brighter & happier the print & colors, the brighter & happier I am. Seriously, I could live in mostly Jeans & T-shirts. I'm a totally casual, sporty-spice kind of girl. Surfer girl style is so appealing. And I'm just not a make-up person. Heels - yeah, they're ok, but they're uncomfortable and my body aches after wearing them. I'd much rather wear cute comfy shoes that support my body's health long term. Hmm, am I a bit practical? Yes. If it means achieving my goals of returning to my athletic self, then I'll be practical! As my fun friend Heidi used to say, "I'm off, like a prom dress, dearies!" What a an adventure this Wardrobe Architecting thing will be.